Unfortunately, Mr. Dawkins, you mean almost everyone who’ve heard of it. Astrology is obviously on par with feng shui as the 2 most widely believed and practiced pseudoscience in the world. Since it was most voted for in the the poll, I’ll give a detailed debunking on claims that astrology has any scientific basis, and show there is none. The study of the movements and relative positions of celestial bodies and their supposed influence on human affairs. The 12 horoscopes that we are so familiar with first originated in Babylon in the second millennium B.C. It started with the belief that the all phenomena are affected by the heavens, be it the life of humans, natural disasters, or simply the weather. 5 planets were identified at that time, with their respective gods: Jupiter with Marduk, Venus with Ishtar, Saturn with Ninurta (Ninib), Mercury with Nabo, and Mars with with Nergal. Together with the sun-god Shamash and the moon-god Sin, they affected the material world with their movements. Babylonian astrology attempts to predict their movements, and from that the fate of everything material. 12 houses were created, which set the basis for the 12 horoscopes today: 1. Life ; 2. Poverty/Riches ; 3. Brothers ; 4. Parents ; 5. Children ; 6. Illness/health ; 7. Wife/husband ; 8.Death ; 9. Religion ; 10. Dignities ; 11. Friendship ; 12. Enmity. Hellenistic astrology appeared in the Mediterranean region sometime around the 1st century BCE. It all began with the conquest of Alexander the Great, where the the Babylonian astrology and Egyptian Decanic astrology merged, forming the first horoscopic astrology. It was the first to use the ascendant, and the 12 celestial house which are derived from it. Much emphasis was shifted to the natal chart, which calculate the position of the heavens when one is born. Western astrology was derived from this. 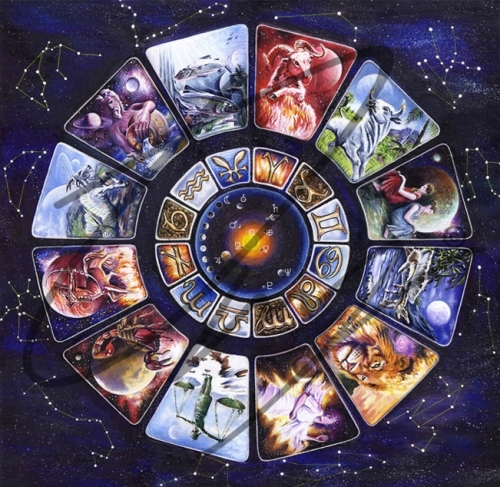 Western astrology is a an extension of Hellenistic astrology, and is based on the zodiac – the belt or band of constellations through which the Sun, Moon, and planets move on their journey across the sky. It is the most practised form of astrology nowadays, filling up newspaper columns daily/weekly. The zodiac begins at the position of Aries at the Northern hemisphere Vernal Equinox, which is always around March 21 of each year. Well, it was supposed to be so, but it has been offset by 1 month since 5000 years ago, and thus cannot be relied upon anymore. More on that later. Chinese astrology is different from other variants in that one’s zodiac is determined based on the year (the Chinese calendar, not the mordern version) he/she is in. There is a 60-year cycle to it, the first of which is the Five Elements (in order Wood, Fire, Earth, Metal, and Water) in their Yin and Yang forms. Then we have the of the 12odiac animal signs (生肖 shēng xiào) or Earthly Branches . They are in order as follows: the rat, ox, tiger, rabbit, dragon, snake, horse, sheep (ram or goat), monkey, rooster, dog, and boar. It is usually used in conjunction with feng shui and other Chinese superstitions. 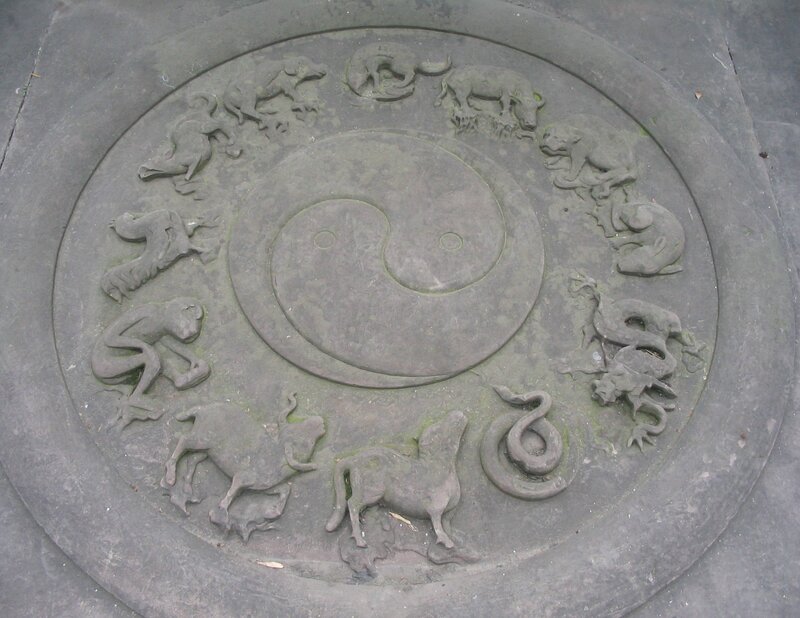 The 12 Chinese Zodiacs. Note the Dao in the middle. It would be perfectly normal to go into a bookstore and see astrology/zodiac/feng shui books taking up over ten times more shelf space than books on science. Why? The answer can’t be simpler. The market for readers of astrology and related superstitions is overwhelmingly bigger than the market for science lovers. And that’s not just it. I bet you to take a look at those apps on social networking platforms, and see how many astrology quizzes there are compared to apps on science education! Or take a survey on our future leaders – teenagers, and see ask how many of them trust astrologers over critical thinking and the scientific method. I did it, and I can tell you, the results aren’t optimistic. So what implications does this hold? Well, instead of driving the progress of science and technology, astrology distracts the people from the true beauty of science, and deludes them with unproven fantasies. Think of it! With decreased numbers of those interested in science, fewer will dive into the field of science/technology, and guess what? Science and tech slows down. Without superstition (most religions included), we should be exploring the galaxy by now. 1. wrongful or criminal deception intended to result in financial or personal gain. 2. a person intending or thing intended to deceive. It is all too common to see astrologers promising a good love life, better income by taking readings and predicting your future. The results are always the same: either the predictions are so vague to be useful, or they are never more accurate than chance. Yet even in face of such results, people are still scammed into giving their money for something that is completely unable to meet their needs, and doesn’t work as pictured in the ads. This is scamming, whether the astrologers are doing so consciously or not. And I damn hate these con-men taking advantage of the gullible. See what happened when parents in England, Indiana, South Africa refused to give their children medical injection because of unproven fears that they would cause autism. Massive measles outbreaks, causing deaths in the hundreds. Or perhaps when people believe that they would get 72 virgins in heaven, and fly a plane into the World Trade Centre. These are only the tip of the iceberg, but it is clear: superstition is damn harmful, and they should be eradicated at all costs, astrology included. When people rely on star signs to guide their life, their productivity decreases, they worry about unfounded predictions, and they spend money and time on useless activities. This adversely affects not only the person, but the productivity of society as a whole. I have given my thoughts on why astrology is harmful, and should be removed. This shall the job of my following posts, where the concept of astrology itself would be completely debunked as superstition and pseudoscience. I don't understand how people can think astrology could work. Once you stop and think about it, it makes no sense. There is no way for the movements of the planets and stars could effect us and if you invent some force to explain it, that force makes no sense then when you add in the planets, asteroids and comets we didn't know about until the 19th and 20th centuries, it would have been impossible for people back then to make predictions because of all the astrological (for lack of a better word) noise the then unknown objects would have made. Yes Lone Wolf, I find it hard to believe in it anymore. However, it was only until last year, when I decided to be atheist that I completely regarded astrology as superstition. However, it seems that a number of my friends do regard astrology as "science", which is why I got the urge to refute astrology. When you consider that books about astrology, feng shui, etc., are sold as "non-fiction", debunking becomes quite important. These are hugely profitable industries with little or no oversight, and people tend to look at them as harmless and benign because to most of us they seem silly, which in a way makes them even more dangerous. Didn't former US President Reagan consult astrologers all the time, basing his decisions, at least in part, over advice received -- from charlatans who had absolutely no qualifications to advise anyone about anything? Yes, godlizard. It makes me wonder why a superstition that originated 5000 years ago would be considered scientific nowadays. All those money wasted on astrology could be used for benevolent means, yet billions are lost every on year on this practice. Thanks for take note, godlizard, and I hope you like my series! Anybody stupid enough to believe in astrology is responsible for themselves. But, that infant trampling video was just disgusting. How traumatizing infants and possibly breaking their bones is going to bless them or bring them good luck is beyond me. And yet, that is the wonder of superstition and further evidence that sceptics should combat it seriously through science. Did I post here before?